During the Khalistani movement near the Punjab and Haryana border there was not a single day when the Jujharoos from Babbar Khalsa and the Indian forces faced each other in the battlefield. There are many historical encounters which took place here, but the one which stands out the most was an encounter between the Babbars and the Hindustani Forces near the village Moujiya. In this encounter 16 villages surrounding Moujiya including the village Raipur had to undertake huge risks in order to help the Singhs. Indian Security Forces had flooded Punjab. The Central Army, Central Reserve Police Force, National Guard, Border Security Force, RAW, etc. had been deployed in full force in Punjab. These outsiders already had a dislike for Sikhs and now as they began to roam the villages and roads of Punjab, took special pleasure in humiliating Sikhs. Rapes became common and the sight of jeeps filled with soldiers became an all too regular terror. All the Jathebandis Khalistan Commando Force, Khalistan Liberation Force, Bhindranwale Tiger Force of Khalistan, and the Babbar Khalsa all decided that the invading forces had to be taught a lesson. It was decided that a direct war should be waged. When CRPF, BSF or Army jeeps would come on a round, the Singhs would attack. The jeep was either stopped by a bomb and then showered with bullets or simply surrounded by Singhs. One such check point which was established by the Babbar Khalsa Singhs was near the village Dodreh. At this checkpoint the Singhs had dressed up as Punjab Police Officials and would search people before letting them go through, so that no Hindustani forces could harass the Sikh villagers. One day the CRP Forces were passing through this checkpoint and as a result were stopped by the Singhs. The Babbar Khalsa Singhs were inspecting the CRP trucks when suddenly some CRP officials so a .30 carbine personal rifle in one of the Singh’s hands. As a result of this the CRP officials began to look suspiciously at the Singhs. The CRP officials then ran through some checks to make sure that the Singhs who had confronted them were actually Punjab Police Officials. They soon found out that these Singhs were part of the Babbar Khalsa, the jathebandhi which had been wreaking havoc amongst the invading Hindustani Terrorists on a day to day basis. An encounter then began. In this encounter three soldiers of C.R.P. and two Punjab Police officials were shot dead. However, Bhai Khem Singh Fauji, from the village Balad Kala was badly injured by the brutal firing of the CRP who had more men and much better weapons. Bhai Jugraj Singh Rashin and Bhai Bashir Muhhamad quickly took the badly wounded Bhai Khem Singh Fauji into their jeep and drove away. The heavy firing from the CRP force’s machine gun ripped the left side tires of the jeep but the driver Bhai Gamdoor Singh Ji with Akaal Purakh’s name on his lips kept driving. In this way the Singhs managed to get away. The Babbar Khalsa Singhs took Bhai Khem Singh Fauji to a safe place in Moujiya so that he could be treated by a doctor. The Babbar Khalsa Singhs had built their hiding places within the crops in the villages of Raipur and Moujiya. An informant who had seen the Singhs reported this to the police who immediately sent their forces to Mouyija. On the 7th of September 1991 the police were 110% sure that the Babbars were in the area. The police made a request to the government to send extra forces. As a consequence hundreds of CRP soldiers and Punjab Police officials surrounded the area around the villages Moujiya and Raipur. On a loudspeaker they then addressed the Babbar Khalsa Singhs, “Tusi Atam Samarpan Kar Deo Nai Ta Maray Jao geh” English: “Give up your weapons or you will be killed”. After listening to this the Babbar Khalsa Singhs, who were only eight in number began to smile as they were happy they might be able to kiss death and attain shaheedi fighting for this path of Guru Nanak Dev Ji Maharaj. Under the command of Bhai Balwinder Singh Gagga, the Singhs picked up their weapons and ammunition and headed to the local Gurudwara Sahib in the village Moujiya. They then did an ardas to Akaal Purakh to give them strength to fight the invading forces. The Singhs then decided to leave the village so that no innocent villager would be hurt in the cross fire. They headed back to their place in the crops where they intended to fight the Hindustani Forces. Before leaving the village the Babbars made an announcement of their own on a loudspeaker. In that announcement they told the invading forces to leave their village or they would have to use force to kick them out. The Police Officials and the CRPF forces went to the place where the Babbar Khalsa Singhs had taken up positions. The invading forces set up a bullet proof tractor and sent this towards the Singhs in the hope that in a few minutes they would be able to kill all eight Singhs without suffering any casualties. As the bullet proof tractor was coming toward the side of Bhai Gurmail Singh Babbar of Raipur the Singh’s with RL 8 Launcher blew it to pieces. Even Bhai Khem Singh Ji who still very badly injured took up a position so that he too could fight alongside his beloved brothers. The Indian forces came into another problem when other villagers started coming into Moujiya through the fields. The invading forces would have difficulty fighting the Babbars as they could not shoot at the villagers. Five or Six could be killed and done away as fake encounters, but the villagers were coming in their hundreds. While this was happening Bhai Balwinder Singh Gagga, Bhai Jugraj Singh, Bhai Balwinder Singh Bullet, Bhai Bashir Muhhamad, Bhai Gamdoor Singh and their companions broke the blockades of the invading forces and went to the villages surrounding Moujiya. Each Singh went to a different village. In just a few minutes most of the villagers got together and blocked every road that went through the village Moujiya. Some villagers opened their water tanks and this water went into the CRP and police trucks. Other villagers got their tractors and began to make huge holes in the local muddy roads leading to Moujiya. This was so that the invading forces could not count on any reinforcements to come and help them. All the villagers picked up whatever they could use as a weapon and headed to the village Moujiya to fight the Hindustani Forces. The Police officials and CRP soldiers were already demoralized when so many of them were being either wounded or killed by the Babbars in this encounter. When they saw the villagers coming, those who were still alive immediately laid down their arms and surrendered to the Singhs. When news of this was circulated to army and police officials they became very angry. How could a force of a couple hundred soldiers and police be defeated by eight Babbar Khalsa Singhs? As a consequence of this at two Air Force Bases near Bathinda, Col. Bhata Chariya and Major Yadav sent out two groups of Para Commando Forces to the village Moujiya to save the Police officials and the CRP Soldiers. Three Babbar Khalsa Singhs had taken up positions near the entrances of the village and had set up machine guns. As the Para Commando Forces tried to enter they were met with a hail of bullets. They did not know which direction these bullets were coming from, all they knew was that their comrades were dropping to the floor under the intense fire. The Babbars were fighting the invading forces like Puratan Singhs for 24 hours and were shouting Jaikaray and slogans of Khalistan during the encounter. When the Para Commando Forces found out where the bullets were coming from they then began to fire without restraint in this area using all sorts of weapons. In this way Bhai Khem Singh Babbar, Bhai Paramjeet Singh Babbar and Bhai Gurmail Singh Babbar attained Martyrdom. These three Singhs of Guru Gobind Singh Ji Maharaj caused the invading forces a huge number of casualties because during September 8th and 9th the CRP medical assistance Red Cross with their ambulances kept coming in with their sirens. For three days the Invading Forces kept looking for their dead soldiers and lost ammunition. After this encounter the Punjab police was scared and they took out their anger on the villagers for helping the Babbars. The villagers clothes, beds etc were thrown outside and all the villagers were kept on the school grounds under the sun. They weren’t given any water or food. 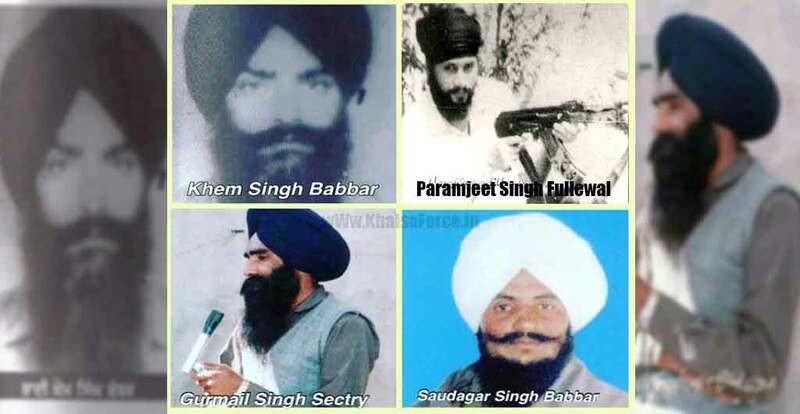 The Babbars who were not blessed with shaheedi during this encounter did not feel sad because three of their Singhs had died, they instead felt more pain when they heard of the things that the police was doing to their fathers and mothers and brothers and sisters and sons and daughters who had helped them in the encounter. The high command of the Babbar Khalsa then sent a threat to the Indian forces to stop those attacks on innocent villagers or the whole Babbar Khalsa would take a step. Bhai Sudagar Singh who was a close friend of Shaheed Bhai Gurmail Singh blew up a Para Commando truck near a bridge in the village Bajaywal. There were two trucks the truck in front was blown up but the one behind had soldiers in it. They immediately got out and encounter took place between Bhai Sudagar Singh and the Soldiers. During this encounter Bhai Sahib fought with a lot of courage and bravery right till he attained Martyrdom. The same day the police took advantage and arrested Bhai Lakha Singh, a residence of the village Raipur. They then killed him in a fake encounter. After news of this fake encounter reached the villagers, they got together and surrounded a police station in Mansa. They then began to protest. The Punjab police made false cases against 350 protestors. Even today the villagers of Raipur remember their great Babbars with a lot of love and respect.